Professional photos coming soon! 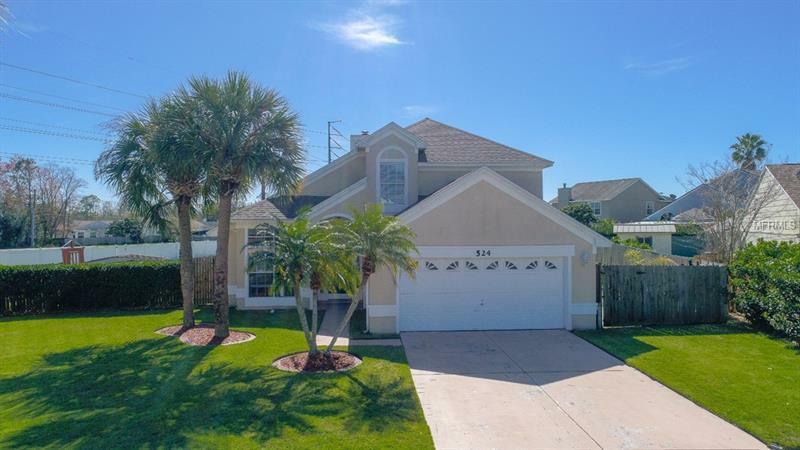 WOW, walking distance to Lake Mary Schools and on a FABULOUS Â½ Acre Lot! As you enter this gorgeous home you are immediately greeted by soaring ceilings and plenty of natural light. The two story spacious family room is a showstopper with the wood-burning fireplace as the centerpiece. The formal dining room includes charming French doors with backyard views and is open to the family room. Perfect for entertaining! The kitchen features stainless steel appliances, breakfast bar, and separate eating area. Easy to maintain ceramic tile floors throughout the first floor. The large master retreat with wood laminate flooring and private access to the outdoors also boasts an en-suite that is beautifully re-tiled and includes his/her vanities, glass enclosed stand up shower and tub, and a walk in closet. Up the staircase you will be delighted by the open loft area with views to the first floor, 2 additional bedrooms and another full bathroom. Generously sized fenced backyard has so much potential. All of the major maintenance items have been addressed! ROOF replaced 2016, A/C replaced 2017, plumbing re-done in 2018, and a brand NEW sprinkler system. Enjoy going for a walk, run or bike ride on the beautiful trail just behind the house! Close to A Rated schools, major highways and plenty of shopping and dining options.